Bond traders (the people who drive day-to-day changes in interest rates) have a lot of information to digest when deciding what's important enough to trade. All too often, fiction gets credit for pushing rates higher or lower, but the facts typically aren't far behind. This week provided several examples. On Wednesday morning, the first viral news story for markets suggested that China would be decreasing its holdings of US Treasuries. Taken at face value, that would be a big deal because China holds over a trillion Dollars of Treasury debt. If that amount began to shrink too much, it would push interest rates higher in the US. Fortunately, there were structural reasons to question the article. These have to do with the nature of foreign currency reserve holdings among major trading partners as well as the way China controls its currency valuation--esoteric stuff that savvy traders fully understand. Nonetheless, financial media gave the article credit for pushing rates higher on Wednesday. Chinese officials subsequently commented on the news, essentially calling it "fake." At that point, one might assume rates would bounce back to lower levels, but they didn't. Again, savvy traders never saw this as a market mover. 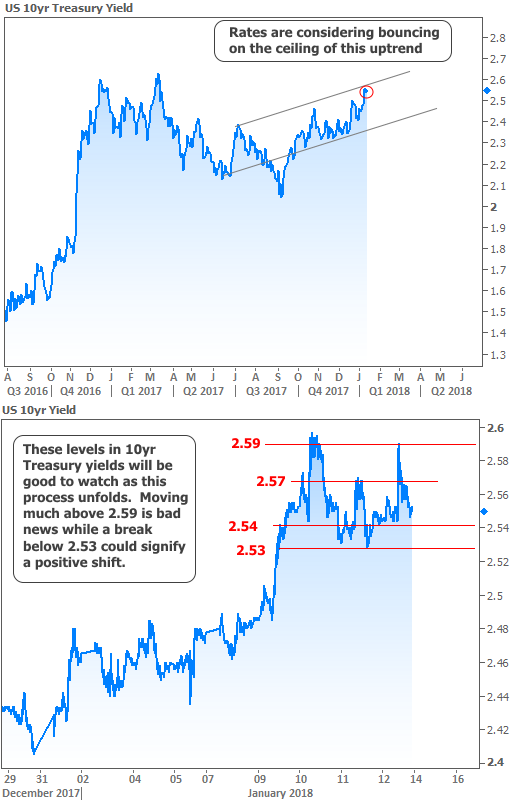 Rates were moving higher for other reasons earlier in the week and the China story rode the coattails of more relevant news. One day before the China news, and somewhere between relevance and red herrings was a legitimate story about Japan buying fewer bonds during a scheduled purchase this week. It was compelling because there were big numbers involved (10 trillion Yen in this case), but here too, the news wasn't as scary as it seemed at first glance. 10 trillion Yen is roughly $88 million in US Dollars. That's couch cushion money when it comes to bond buying among the world's largest central banks. Moreover, the amount was well within the boundaries previously laid out by Japan's central bank. That's not to say it didn't matter. Investors were rightfully concerned that the reduction could mark the beginning of a trend. That's why we can give it some credit for pushing rates higher, but it's not the star of this week's show. 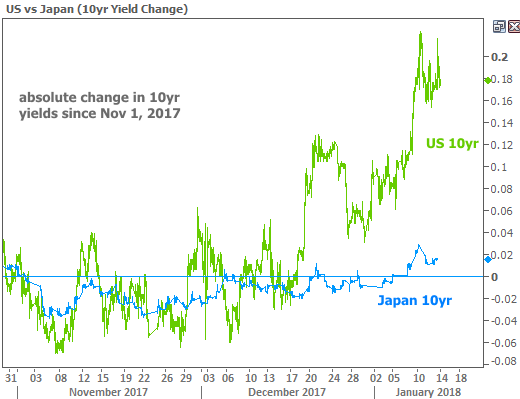 For proof, simply look at relative movements between 10yr yields in the US and Japan. So what are rates so worried about if not for Japan and China? "New Year momentum" refers to the first major glut of trading activity typically seen in a new year. This usually manifests itself during the 2nd week of January. 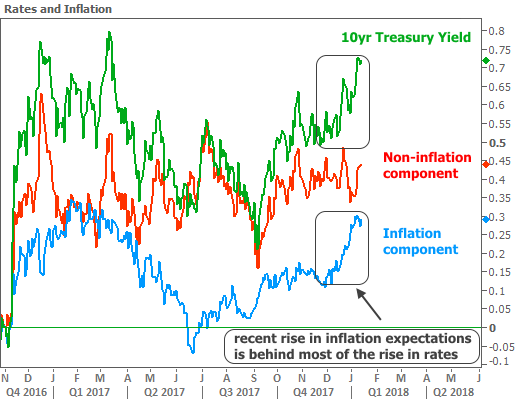 In cases where the preceding weeks or months have been sideways or narrow in terms of rate ranges, the implication is for the new year momentum to push rates clearly higher or lower. That's true of 2018 so far, but "supply" and inflation could be tipping the scales. "Supply" refers to new debt that investors need to buy. This can be corporate debt at times, but it always includes US Treasury debt. This week played host to the year's first major auctions of longer-term Treasury debt. It's not uncommon for bond traders to shy away from buying bonds ahead of such auctions. Lower buying demand = higher rates. These supply jitters definitely played a role in this week's early rate spike. Inflation is a well-known concept, but it's had a checkered past since 2011 when it comes to interest rates. For most of modern economic history, higher inflation meant higher rates... period. That correlation broke down in grand fashion after the Financial Crisis, but just in the past year, it's making a comeback. Investors figured the new administration (with a GOP majority) would be able to pass legislation (like the tax bill) that resulted in increased government spending, thus putting upward pressure on inflation. Market participants were indeed ready to send rates higher at the first sign of inflation. In fact, much of the late 2016 rate spike had to do with ANTICIPATION for inflationary policies. 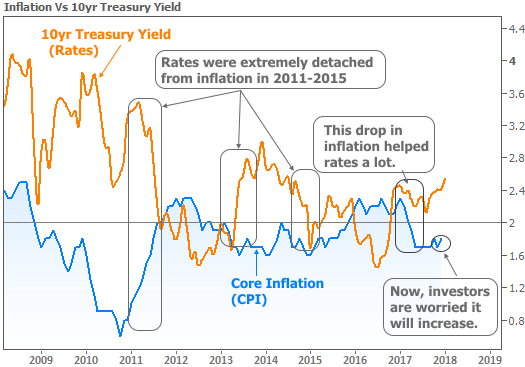 At that time, core inflation had been in a holding pattern for the whole year. The holding pattern continued for several more months before inflation finally budged. Interestingly enough, it moved noticeably LOWER. Not only that, but it remained lower for 5 puzzling months. This helped rates move lower during a year where they were widely expected to increase. Core inflation readings finally started to pick up at the end of 2017. Although the uptick was very small, it coincided with the passage of the tax bill as well as higher oil prices. The result was a concerted push toward higher rates that was exclusively driven by inflation. All this to say that inflation matters right now. Bond markets were anxious about Friday's release of official inflation numbers. The anxiety was justified when core inflation once again lifted off its recent floor, moving up to 1.8% from 1.7% previously. Rates spiked in response, but managed to find a ceiling before breaking above recent highs. Some traders are hoping these ceilings will serve to help calm the recent rise in rates. Even if the broader uptrend remains intact, simply moving to the lower boundary of that trend (seen in the top of the following chart) would make a positive difference for prospective mortgage borrowers in the coming weeks.